Knowing how to find the ingredients to make candles is the first step towards mastering this fun craft. Before you can begin your candle making project, you'll need to pick up a few necessities. Paraffin wax: This is the cheapest and most common choice for candle making. Beeswax: Beeswax is great for making natural candles, but it can be very expensive. It is sold either in blocks or sheets with a distinctive honeycomb pattern. Soy wax: Soy wax is another all natural alternative to paraffin wax, but much more affordable than beeswax. 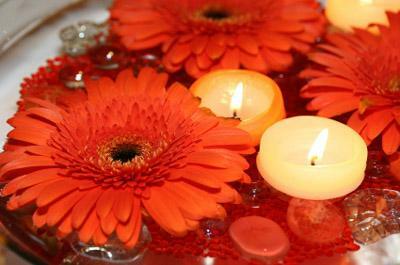 Soy candles are said to last up to 50% longer than paraffin candles. Candles don't necessarily need to have a scent, but most people who are searching for ingredients to make candles do plan on adding a fragrance to their creations. If you're just starting out and looking for a very simple way to add scent to your candles, try using a few drops of vanilla extract from your kitchen. Since vanilla is universally popular and not too overpowering, this is a great way to save a bit of cash while you're working on mastering basic candle making techniques. For more scent options, you can purchase candle making fragrance oils. These oils come in every scent you can imagine, from floral and fruit scents to fun combinations like "Winter Wonderland" or "Summer Breeze." Some fragrance oils are skin safe and can also be used to create lotions and soaps, but many people feel oils made especially for candle making will give you the best results. If you're interested in creating aromatherapy candles and not concerned about the cost of supplies, creating candles with essential oils can be an enjoyable experience. Unlike synthetic fragrance oils, essential oils are made from natural plant extracts. Candle wax is usually either white or a cream color. If you want colored candles, you'll need to purchase some sort of dye before beginning your project. Dye for candle making can be purchased in chips, blocks, or small bottles. A little goes a long way, so keep this in mind when deciding what color you want your candle to be. When making paraffin candles, it's possible to use bits of broken crayons to add color to your finished candle. You won't get as vibrant of colors as if you'd purchased candle making dye, but this is a good way to enjoy frugal candle making with young crafters. See the LoveToKnow Candles article Candle Making and Crayola Crayons for more information on this technique. Containers for candle making can be anything that is free of cracks and heat resistant. This includes flower pots, tea cups, drinking glasses, and canning jars. If you're looking to save money, check out the selection of materials available at your local thrift shop or consignment store. If you prefer to use a mold for making your candle, you can either purchase molds made especially for candle making or create your own molds by repurposing materials from around your home. For example, muffin tins, cupcake pans, and novelty baking molds are great for using in candle making. Old milk cartons are also good for candle making since you can simply cut the carton off when the wax has hardened. Obviously, your candle isn't going to burn without a wick. You can choose to either buy your wicks or make them by following the instructions in the LoveToKnow Candles article on Homemade Candle Wicks.